This is the BETA release for Linux Mint 18.3 “Sylvia” KDE Edition. Linux Mint 18.3 is a long term support release which will be supported until 2021. It comes with updated software and brings refinements and many new features to make your desktop even more comfortable to use. This new version of Linux Mint contains many improvements. “What’s new in Linux Mint 18.3 KDE“. The release notes provide important information about known issues, as well as explanations, workarounds and solutions. 2GB RAM (2GB recommended for a comfortable usage). 15GB of disk space (20GB recommended). 1024×768 resolution (on lower resolutions, press ALT to drag windows with the mouse if they don’t fit in the screen). The 64-bit ISO can boot with BIOS or UEFI. The 32-bit ISO can only boot with BIOS. The 64-bit ISO is recommended for all modern computers (Almost all computers sold since 2007 are equipped with 64-bit processors). This BETA release might contain critical bugs, please only use it for testing purposes and to help the Linux Mint team fix issues prior to the stable release. It will be possible to upgrade from this BETA to the stable release. It will also be possible to upgrade from Linux Mint 18.2. Upgrade instructions will be published after the stable release of Linux Mint 18.3. Please report bugs below in the comment section of this blog. Bugs we can reproduce, or which cause we understand are usually fixed very easily. It is important to mention whether a bug happens “always”, or “sometimes”, and what triggers it. If a bug happens but didn’t happen before, or doesn’t happen in another distribution, or doesn’t happen in a different environment, please mention it and try to pinpoint the differences at play. If we can’t reproduce a particular bug and we don’t understand its cause, it’s unlikely we’ll be able to fix it. Please visit https://github.com/linuxmint/Roadmap to follow the progress of the development team between the BETA and the stable release. A 32-bit ISO image is also available at https://www.linuxmint.com/download_all.php. Once you have downloaded an image, please verify its integrity and authenticity. Anyone can produce fake ISO images, it is your responsibility to check you are downloading the official ones. We look forward to receiving your feedback. Many thanks in advance for testing the BETA! ne fonctionne pas VPN ne fonctionne pas spécialement l2tp. Allez-vous intégrer VPN dans l’image en direct? bien qu’en fait il ne gâche pas vpn l2tp il y a un kit de distribution russe à la cannelle ROSA R9 vpn l2tp là travaillant avec une image en direct ne peut pas être injecté dans la cannelle? This is a really bad translation 🙂 We got your feedback on l2tp during the Cinnamon BETA and this was considered outside of our scope. Though, out of curiosity, which package(s) in particular are you talking about? Why plasma 5.8 and not the latest stable version?? Too much work for a “discontinued model/distribution” …. That is why I left Mint (which I loved to use for more than 5 years). Now I’m running SolydK, based on Debian stable, which runs very stable Plasma 5.8.6. I have tried KDE Neon with a newer Plasma version (5.8.8) which was not stable yet. One out of five times it refused to start after loggin in. Mint is great if you like Cinnamon (although unstable for me in Mint 18.2) or Xfce or Mate (stable but old fashioned) but for KDE you better start looking for something else now. Don’t get me wrong, I understand why Mint drops KDE but it makes me a bit sad. Нет ли у вас с образа минт корицы с уже установленным VPN L2TP ? Приходиться использовать windows хотя за 4 года привык и полюбил минт корицу . Я нашел только ROSA R9 с рабочими VPN но таким линукс пусть сами пользуются. Не получается без интернета установить L2tp . Очень много провайдеров интернета использую L2p ролтеры сильно режут скорость приходиться использовать кабель в компьютер. Очень много на форумах неудачных установок протокола l2tp . Без интернета вобще его установить не получается. Внедрите пожалуйста VPN L2TP в дистрибутив. Хорошо бы ссылку linux mint с рабочим l2tp. Он нужен в дистрибутиве ! linux без интернета сами понимаете…. Еще бы установщик видео драйверов в будущий LMDE3 и VPN L2tp – К новому году желанье ! В linux ROSA R9 KDE очень много работающих с образа VPN их бы внедрить в Дистрибутив linux mint . Thanks for 18.3. love linux mint. А ещо я удаляю Rhythmbox и ставлю вместо него Audacious в исполнении винампа Все остальные утилиты и программы в корице я обожаю ! Надеюсь меня услышит. Cinnamon freezes quite often and enters a “fallback modus” from where I can restart Cinnamon. Usually it happens immedeately after login or when I close windows. Sorry, this was posted under the wrong article. Please ignore this. The designers of DEs need to understand that their contribution is NOT the major portion of the distribution. A LOT of users need to understand this primary, major concept also. I fear this transmission. last I used kde plasma it was buggy af. It was only about 2 weeks ago. Had a lot of issues with it. The Backup Tool is compatible with similar tool from Linux Mint Maya? I wish to get data from Home directory. RAM usage is 500MB, but something is using CPU little more than Linux Mint KDE 18.2 (maybe plasmashell process). I still hope you will not abandon KDE edition. Best Regards to Linux Mint Team. an old version worked ! It would be nice to know if it is compatible ? In LM18.3 I got a problem with the terminal using ”su’. It wont accept my password. I can login as usual. Using GParted accepts the password as usual. Do I do something wrong? Merci pour ça, la toute dernière version de Linux Mint KDE. Ce sera manqué. Intel NVMe 256 SSD with two more hardrives totalling 3tb and 256 ssd with windows 10 pro. Hyper 212 Evo cooler (lol). I made my usb flashdrive bootable with the program Universal-USB-Installer-1.9.7.9.exe. I formatted the 16Gb flashdrive before making it bootable, and I also selected the option to format the flashdrive before making my bootable flashdrive. Then I proceeded to restart Windows. I then pressed the button that took me to the BIOS. I then selected the boot option to be the one that had UEFI: Name of Flashdrive as the priority. I then saved the changes and exited. After it restarted, it took me to the GRUB. Here I chose the first option. After that it showed me the error I have typed above. I have chosen the other options as well. However, they all show the same thing except the for when I run in compatibility mode, which is another error Its a screen long so I can’t type all of it. I took a picture, if you need it I can send it to you. But the last line that I saw was  fb: switching to nouveaufb from EFI VGA… and nothing happens. So I am forced to press the restart button on my tower with both errors. BTW, the ACPI errors look not to be fatal. I always have all four of them on all my machines when a newer linux kernel is booted, it’s ‘OK’ 🙂 The fatal is the incompatibility of newer kernels and some hardware plus the absence of some drivers in the iso. Will KDE users keep getting non-plasma software updates after 18.3 or that’s it for good and we’ll have to use whatever versions are available in 18.3 unless we switch to different Mint edition? You’ll continue to receive package updates on the base until 2021 (not new features, but bug and security fixes). You’ll also receive updates on Plasma/KDE from Kubuntu via their Backports PPA which is used by default in this edition. Thx for this great edition! I’ve always done that too. Some config files might not be right from one version to the next, so a few things might not work as expected (though I’ve never had any issues). If you don’t repartition your drive (just reuse the same partition layout) and don’t reformat your /usr partition, you don’t even have to save and restore your home folder (DO back it up to an external HD just in case though!). I had installed Linux Mint 18.3 Cinnamon Sylvia yesterday ( 6 Dec 2017) ( first Linux on my own PC) and had to hard boot my PC thrice since. 1) On clicking Suspend, it slept but I couldn’t wake it again. 2) While using Stellarium, on clicking settings, the PC went to lock screen and no key (even ctrl+alt+del) would change that. Even time didn’t update. 3) Today When my screen prompted low battery, as soon as I switched power on, the screen went black and I had to hard boot when no key or key combination was working.. Provided that I have Windows (and important files) on my laptop too , I want a stable version of Linux on my PC. Should I switch to an older version of Mint? Also, if possible, please explain the cause of these problems, as I am expecting to contribute to open source. Everything is working perfectly on a Dell Inspiron laptop from 2011. This KDE environment is great, looks cool and functions well. I am very impressed and I like it much more than Cinnamon, which i used for the last few years. No issues yet. You can change the 2G to 3G or 4G what swap file size you prefer. If you don’t hibernate you can keep swap file size 2G or 3G as its almost never used. As swap partition is almost never used unless you use hibernate, swap file is better option otherwise you will be just wasting hard drive space of around size little more than your Ram or perhaps double the size or your Ram. Mint KDE 17.3 has been so stable and suitable for my needs that I never upgraded to 18. Well, now that you’ve had such a long time to really polish this new line, I’ll probably take this final upgrade, knowing I’ll be good till 2021. Then, I’ll have a hard choice to make, sure wish you’d keep the KDE edition, it’s probably the best one there is! You need to install CrossOver for Microsoft Office 2016 for now. If you want to install MS Office 2016 and use lots of .exe files, perhaps you should just install Windows? Stay on Microsloth Windows if you want to use MS Office and .exe files. Don’t introduce crappy MS software on superior Linux systems. It ruins a well designed system. Libre Office is fine for most of us. And for most other applications a Linux alternative is available. Wilo, please I like to use the linux mint but the only issue I’m having is the Office. if I’m able to install it, it will be enough for me. I even won’t think about the rest of the exe. files. Use Playonlinux to install your MS-Office apps into. If you want near native speed, then QEMU is the best way to go instead of VirtualBox. You can use QEMU with Gnome Boxes or Virt Manager. Thank you, thatcat7, I’ll have a look at QEMU. I can’t have near native speed on VirtualBox, that’s right. Though it’s ok for my 2D production with no animation still. So I’m using it but who knows. Thanks guys….thatcat7 I’ve downloaded the codeweavers but it’s rather unfortunate that I would have to use the trial version but I really appreciate you help. Well, I think the developers have to improve on the Libreoffices interface cus it looks pretty old and not catchy. Its a commercial version of wine so yeah you will need to pay for it but i think Wine Staging will soon add support for Microsoft Office 2016. Currently of Wine can run Microsoft Office 2007, 2010 and 2013 if you don’t mind using older version of Microsoft Office. For Microsoft Office 2016 its best to run it in VirtualBox or QEMU for now. I’m using Playonlinux to run my MS-Office software for a number of years now. Works fine. Make sure you install the MS-Office Fonts into the Ms-Office virtual drive also. Wine can be a real pain to get up and running properly for new users. I generally avoid windows software entirely wherever possible, opting for their open source alternatives wherever suitable ones are available. When I can’t get by without a certain piece of Windows software, I just run a virtual machine. It’s easier to set up and less likely to run into compatibility issues. This will be the best KDE Plasma LTS distro ever. I hope you will change your mind and release a Linux Mint 19 KDE with the new Plasma 5.12LTS, the KDE users community really needs such a user friendly, stable and polished distro. Hello guys, please I’m stuck between Mint 18.3 Cinnamon and Mint 18.3 KDE. Don’t know which one to go for. Any advice? Please is Linux Mint deb or rpm? Funny question right? 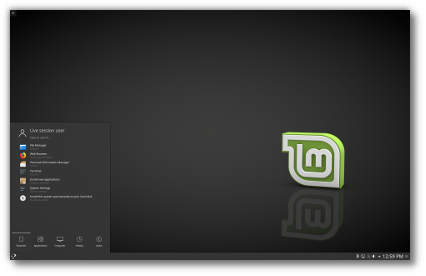 Pardon me cos I’m now getting to know much about Linux and Linux Mint to be precise. Thanks. But try to install software via the software manager if possible because only in that way you will receive automatic updates via Mint update! So use .deb files only if there is no other option and be sure they are from a reliable source. Im using A hp laptop of 2.4gh and 4gb ram . which is the best Linux for me. I just installed Linux Mint 18.3 Cinnamon 64 bit. I cannot get it to run beyond the initial Start as it asks for a login and a password. I found out the login should be Mint but I am unable to find out what do I use for a password. Someone online said you do not need to put a password in – that you just need to hit “enter: That does not work for me. 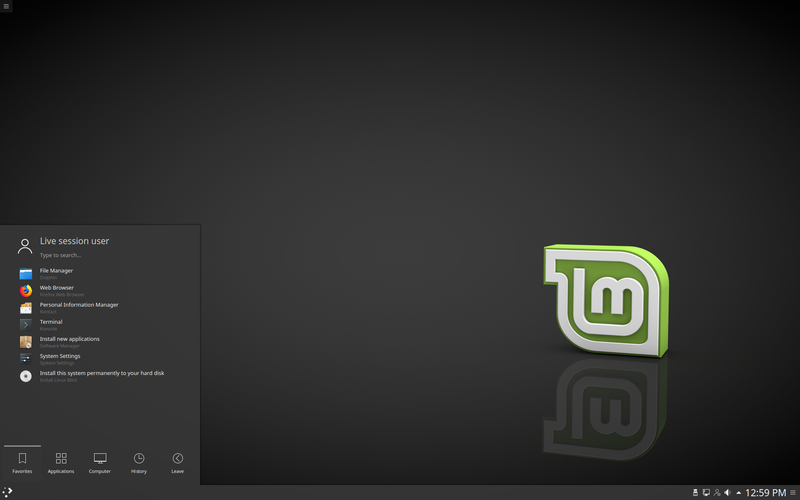 I just installed Linux Mint 18.3 64 bit. When I run it it wants a login and a password. I put mint in the login but I have no idea what to use for a password. I read online that I only need to hit “enter’ and it will run but that does not work for me. What do I use for a password ? It’s also available in the Flatpak section of the Software Manager. You’re probably better off using a PPA. That way, the package manager can keep it updated to the latest version as updates are released. That aside, Version: 5.1.6.2 is the one offered with Linux Mint and it works just fine. In fact, I’ve found some minor annoyances with the newer version. Be careful what you wish for. It’s to have a very good spelling facility in LibreOffice right from the very start. I’ve been using the 18.3 KDE Beta for a while and it is flawless. I love it. I will be using this one for a long time. Sure hope someone changes their mind and we see KDE again in the future in Mint. Thanks to everyone for your hard work with the KDE project. I went from Cinnamon to KDE only to be left out in the dark just as I was getting comfortable with it. I’m not going back now. Plasma 5 is superior to everything else out there. I’m so sad to go, but I’ll be leaving Linux Mint in search of another suitable KDE distro.